Real-time controls such as the four knobs and fader can be used to control instrument or mix parameters, even while you play. Professional-style pitch bend and modulation wheels allow you to add further articulation. The 3-digit LED display provides navigational feedback so it's quick and easy to find the right menus for changing MIDI channels, sending out program changes, transposing or programming the real time controls. 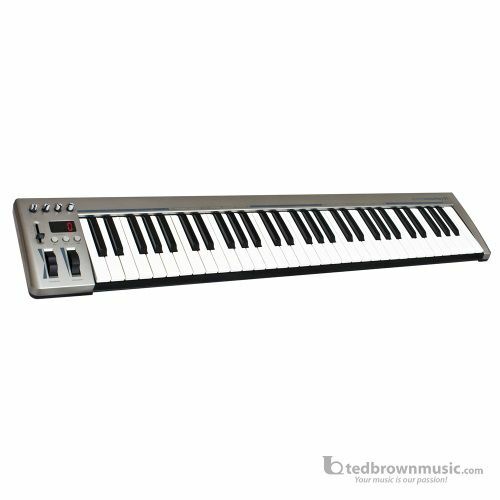 And if 61 keys are not enough, press the octave up and down buttons to shift the keyboard range up or down instantly. Installation is straightforward too. Simply plug Masterkey 61 into a USB port on your computer and the operating system will do the rest. Masterkey 61 is USB class-compliant, which means that no driver is needed for supported operating systems. Presonus Studio One™ Artist: Studio One™ Artist is a powerful recording and production platform that lets you work quickly and stay focused on your inspiration. Incredibly easy to learn, it offers unlimited tracks and plug-ins and delivers features not normally found in entry-level DAWs. Access powerful editing tools without wading through menus. Load and save audio clips, MIDI files, effects, and VIs by drag-and-drop. Need an instrument, effects plug-in, or drum loop? Just drag what you need from the content Browser, drop it into the arrangement, and everything is taken care of. Unit Weight: 4.2lbs/2kg; Unit Dimensions: 31.5" x 7.5" x 3"